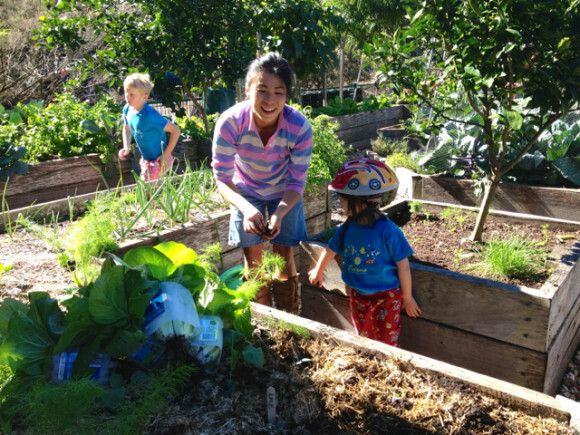 This week we welcomed more new volunteers, local residents Caroline Kim and her family, Vanessa Piercey and her friend Špela Berlec joined the Sunday work bee. Another local resident Richard came back with his two sons Finn and Sebastian. All children enthusiastically helped their mum and dad and others with many tasks. As Limor and her family are already a regular, it’s lovely to see more young families are joining us! It was a gorgeous day with another great variety of harvest to share such as carrots, lettuces, rocket, tatsoi, broccoli, cauliflower, Chinese cabbage and more. Since last Thursday we have started temporarily locking the garden gate during the night in order to prevent further theft. All produce seemed to be fine except for some inappropriately cut spinach, which Limor and Adar attended to carefully trim the spent stems at the base. When I was harvesting broccoli with Finn, he asked what the tall plants growing next to them were. They are the sweet potatoes planted by our ex-volunteer Ken Josh several months ago. The vines have grown all the way up the trellises and started to become yellowish. So we were expecting to harvest as the leaves go brown. 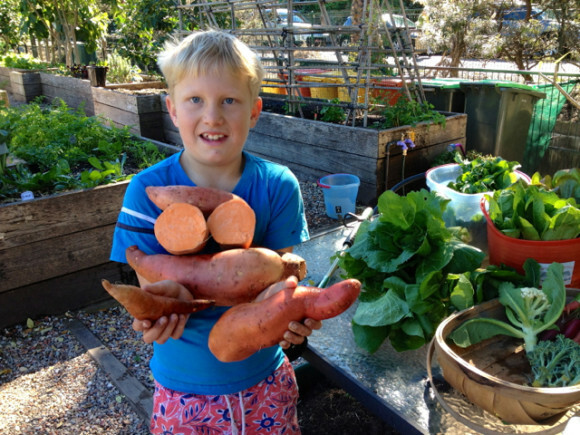 However, Finn spotted a couple of large sweet potatoes had already emerged from the soil and asked me if we could harvest. I could not see them from where I was standing so it’s great to have children look for something like this! Finn went for a great length trying to dig up the sweet potatoes without damaging vines and other potential harvest still underground. With the help from Vanessa and Špela he found not only two but several large sweet potatoes (see one of the photos of the proud young digger). 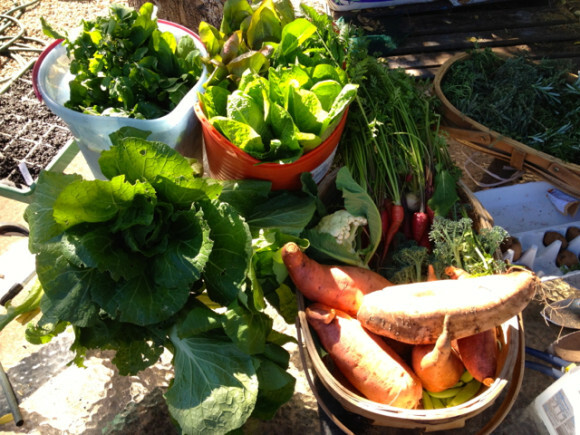 I imagine Ken might be so jealous if he saw our first harvest as he and wife Beth had moved up to the northern NSW a few months ago, or they may already be enjoying their crop at their local community garden!? Anyhow we thank Ken and Beth for initially planting them here at MCG! We’ll surely enjoy harvesting more in the coming weeks. We also harvested a few healthy looking Chinese cabbages. Then some people asked me how to use them. I like to use them in Asian stir fry dishes or in salads with a Japanese type of dressing. It is also easy to make pickles with a few pinches of salt rubbed into roughly chopped Chinese cabbage and sliced cucumber, leave them for 15-20 minutes and squeeze out water before serving. They are used for making Kimchi, traditional fermented Korean side dish with a variety of seasonings such as chilli and garlic. Caroline also suggested Chinese cabbage is nice to enjoy raw, just by dipping into fish sauce with a chopped chilli. Sounds yummy. Thanks to Deb’s mid-week planting, we now have new strawberry crowns in the bags on the canal fence. We also planted seeds of stevia sugar plant (to be used as natural sweetener for our herbal tea) and red round radish. As the weather warms up, we’ll be planting many more vegetables and herbs. By the time we sat down for our tea freshly made by Caroline this time, we had already finished almost all the tasks thanks to as many as 20 volunteers! Hoping to see you all gain soon. Congratulations Yumi and the rest of the volunteers. Continuing to watch from a-far (near) and am inspired by your enthusiasm. Thanks Dave! Don’t work too hard. Hoping to see you soon!